Indian beading designs developed over a period of time as the natives continued to experiment with new materials. Traditionally the most commonly used materials included coral, shells, turquoise and other such stones. These would be used in combination with silver, copper, amber, animal bones, horns, teeth and ivory. The modern world recognizes the use of glass beads with native Indian people. However it was not until the Europeans brought over the glass beads to America that the natives began developing beading patterns using glass beads. The natives were quick to take on this new material that they were introduced to in the form of fine seed beads. Ever since the introduction of glass beads they became the material of choice for Indian beading designs. 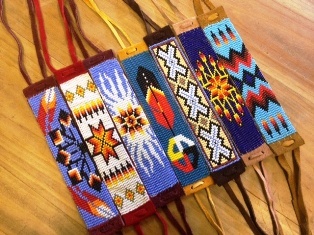 The variety of Indian beading designs, techniques, traditions, stitches and styles probably exceeds the number of tribes there are of Native Americans. Traditional Indian beading designs are based on an intricate style of stitch beading known as Peyote. This was used in combination with head pipe chokers. However with the passage of time new and innovative techniques were introduced into native Indian beadwork. The eastern Indians are credited for developing unique beadwork patterns for wampum belts. On the other hand the West Coast Indians developed the unique dentalium strands which featured intricate beadwork. One of the most popular Indian beading designs is the floral beadwork. This pattern was developed at the hands of the Northern Indians and is perhaps the most popular concept when it comes to native beadwork. Another prominent creation that came about at the hands of the southwest Indians were the beadwork patterns made using turquoise heishi beads and shells. One of the things that sets Indian beadwork apart is the use of unique and different kinds of beads. The Native Americans would engage in trading of beads across different territories. This is why you will be able to find the beadwork of one particular geographical region to be made using materials that were found in a distant territory. For example Cherokee beadwork was made using abalone shells that were imported from the West Coast. Similarly one can find Chippewa beading designs to be incorporating quahog wampum that originates from the East Coast. Indian beadwork is basically of two types. One category of Indian beadwork is classified as beaded leather. This includes items such as clothing, containers and moccasins. The other category is known as beaded strands which includes designs for jewelry and other ornamental covers that were used to wrap around different objects. Leather beadwork patterns were created using a leather backing upon which the beads would be sewed on by the craftsman. This was a very painstaking process which required each bead to be stitched on individually. In other cases the beads would be attached in rows and loops. This style of designing was known as the lazy stitch. Beaded strands on the other hand were strings of beads that were made using thread, wire and sinew. Traditionally this process was conducted by hand but later on the natives started making use of bow looms. This allowed them to create far more complex designs for beaded strands.